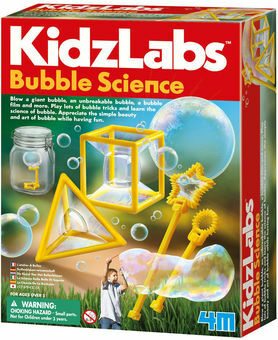 Create square bubbles, unbreakable bubbles, and much more with the 4M KidzLabs Bubble Science Kit. Through a series of experiments and fun bubble tricks, kids can learn about the fascinating science of bubble geometry. A variety of bubble frames are provided to create bubbles of different shapes and sizes, plus recipes to create special, high-quality bubble mixtures. Detailed instructions included. Recommended for ages 5 and up.